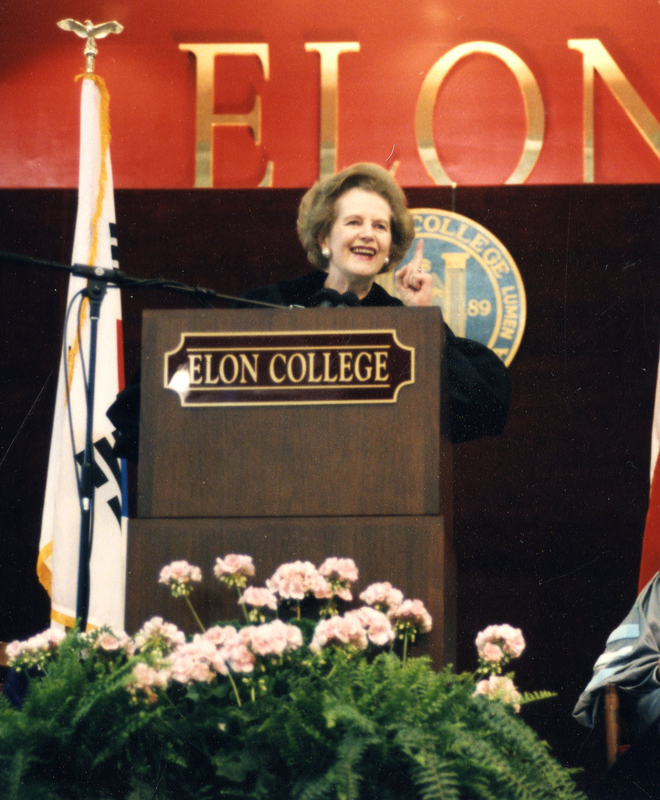 On April 28, 1995, Lady Margaret Thatcher spoke at Elon College’s Spring Convocation. The theme of the event was academic excellence, community service, and philanthropy. Lady Thatcher discussed the purpose of universities in her speech titled “The Challenges Facing the 21st Century” and encouraged individuality among students. She was critical of communism, President Clinton, the separation of church and state, educational trends, and welfare. While some in the audience disagreed with her political stances or thought the event was too political, many were impressed by the conviction of her opinions. The Class of 1995 was recognized for academic excellence; Lady Thatcher, Frank H. Kenan, the Koury family, Robert Model, and the Moseley family were acknowledged for their community service. Members of the Elon Society were thanked for their generous donations, which helped fund Lady Thatcher’s visit. Lady Thatcher dedicated the Moseley Center before convocation. Lady Thatcher was awarded an honorary Doctor of Laws degree and exclaimed, “I worked four to five years for a degree in chemistry. I reckon I worked 35 years for this one.” Lady Thatcher brought an “international presence to convocation” with an audience of almost 3000. Her “Iron Lady” characteristics were apparent throughout her visit and as one journalist acknowledged, she brought grace, wit, and charm to Elon College. This entry was posted in Academics, Cultural events, General Elon History. Bookmark the permalink.